Each year Fan Expo is always different, from the panels, booths and celebrities that vary between franchises. This year the focus was Back to the Future with Lea Thompson, Tom Wilson, Christopher Lloyd, and even Michael J. Fox making a rare appearance. While Fan Expo does try to appeal to a wide variety of people by featuring established guests from Sci-Fi, Fantasy, Anime, Horror, Comics and Gaming, there are always a few booths who don’t necessarily fall into those categories, but attend because sheer volume of people there. I always go to the show floor as soon as the doors open, before it gets too crowded. On Friday morning most of the artists were already set up from the day before so even if they weren’t at their booth, some of their artwork was on display to check out. It’s nice to stroll the aisles at your own pace before it gets unbearably cramped. I didn’t end up buying any prints this year though. While there was some amazing art, the prints I buy usually end up sitting in my closet until I remember about them next year at Fan Expo, when I want to buy more prints or buttons or key chains. This year I encountered an odd booth for OLG (Ontario Lottery and Gaming), who were featuring their new lottery game. I’m sure a lot of people who attended the event play the lottery, but it just seemed out of place. Omen by HP had a booth I haven’t seen in previous years that I thought was a nice touch. Featuring the latest products in PC gaming, they had several setups people could try with Fortnite. Blizzard had a huge display for Hearthstone, Overwatch, Diablo, and the new expansion released for World of Warcraft. Nintendo had a decent sized booth for the Switch, showcasing current and upcoming games like Smash Bros Ultimate, Splatoon 2, Mario Aces and a small display for Pokémon Let’s Go for the Poke Ball accessory. Sony had a bigger setup than Nintendo for their VR games like Tetris Effect, Super Hot, and Beat Saber to name a few. On the PS4 they had the Spyro trilogy, and the new Spider-Man. EB Games had a huge store with anything and everything you could want, from video games to board games and accessories. 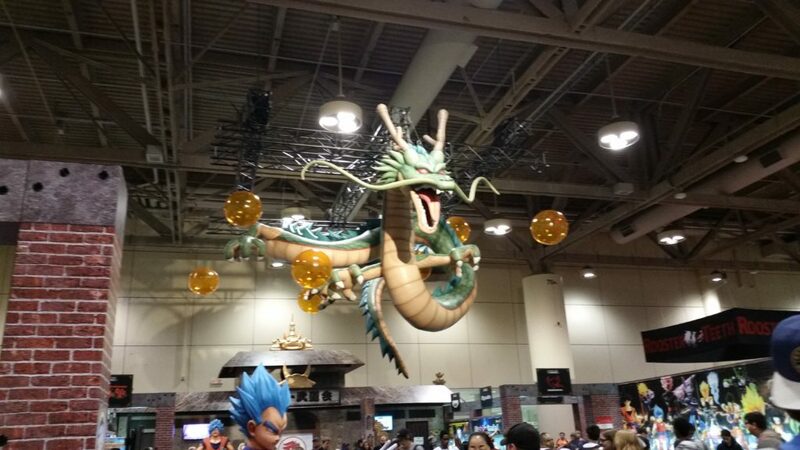 Dragonball had a presence as part of the Dragonball North America Tour 2018, with other stops including San Dieago Comic-Con and New York Comic Con. Booth featured DragonBall super card game, the mobile game Dragonball Legends, Dragonball Fighter Z, and action figures. A personal highlight for me was seeing Sam Maggs and getting her autograph. 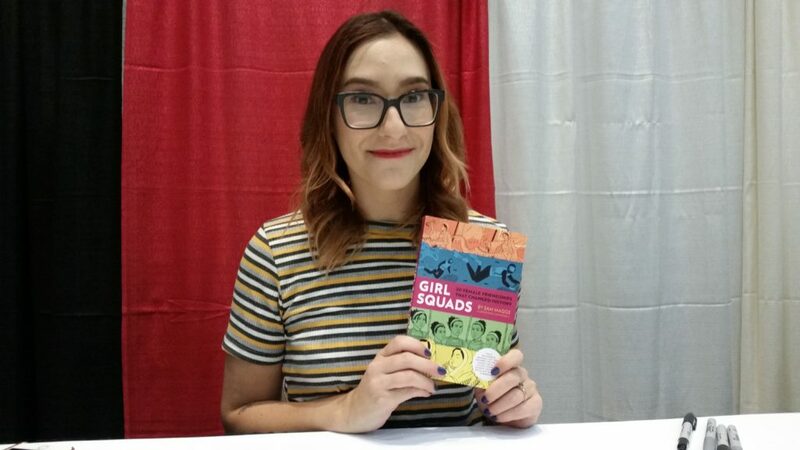 Sam is the author of The Fangirl’s Guide to the Galaxy, Wonder Women, and coming this October, her latest book Girl Squads. 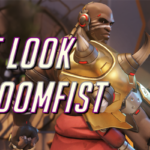 She has also written for various comics, video games, and anthologies. She is an amazing writer and I highly recommend her work! 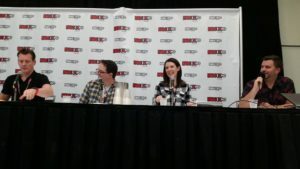 Two panel highlights for me were the Talk from Superheroes live recording, and Navigating a Comics Career. Talk From Superheroes hosts Andrew Ivimey and Diana McCallum were joined by special guests Jason Deline and Ian MacIntyre for a live recording of their podcast covering Blade 2. I loved this panel, they always do a great job analyzing the movie or show and talking about its strengths and weaknesses. They don’t always agree about whether or not they like the show or movie, the Batman Forever episode is a great example (and a great episode to listen to), and that clashing opinion makes the podcast interesting. 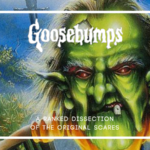 Some of the movies they review are from the 90’s and early 2000’s, so they talk about the nostalgia of when they first came out and how the films hold up to today’s standards. I recommend checking out their site to find out more about the From Superheroes network! I was also excited to attend the Creator Resource panel Navigating a Comics Career: Pitching, Networking and Self-care. 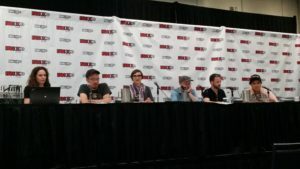 This was an excellent panel to attend even if you aren’t thinking about a career in comics, just to get an insight into the industry and how artists work. Panelists Megan Kearney, Leisha-Marie Riddel, Cian Tormey, and Michael Walsh moderated by Eric Kim and Rogues Portal own Editor In Chief, Stephanie Cooke. This panel was super informative, not only touching on how these people got started in the industry, but also how they continue to change and adapt to current technologies and trends. It was interesting to see what works for some artists, such as working from home, keeping a schedule, stepping away from your work every once in a while or taking a break, different things work for different artists. 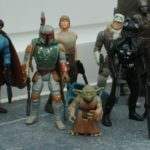 Creator Resource has all kinds of information about the industry, and resources to help you navigate comic book contracts, copyrights, trademarks, and more.